We have been asked to print all sorts of designs to many different materials, and to do this we use a a UV solvent ink in a digital flatbed printer. This printer enables us to print an 8 foot by 4 foot sheet in one hit and so is an excellent printer for printing sign material and many other things from glass, acrylics, plactics, wood, aluminium panels and even mirrors! This machine differs from normal inkjet printers as the head not only has Cyan, Magenta, Yellow & Black inks, but also a white primer and a varnish. Using the white along side the colours enables us to print on to darker or clear materials and still obtain vibrant colours and not have them wash out when they are illuminated. 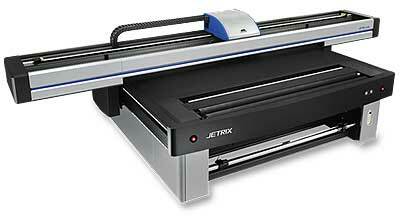 The machine also allows us to print matertials up to 100mm thick which makes it idea to print onto our signtrays.